Here's the cake I've just completed for my daughters 15th birthday party. It is meant to represent a lady's brush and jewellery box. I'm very new to cake decorating, so it's not my best work by far. It's for a Murder-Mystery-Downton-Abbey Style party. I currently have a house full of 15 year old girls, dressed 1920s style. Fun, and how gorgeous they all are! The cake is a long way from perfect, and in some respects, I was disappointed in how it turned out. But as my friend Annabel says, it doesn't have to be perfect to be memorable. One of my goals this year, and something I'll be sharing more on soon, is not outsourcing our lives. Outsourcing has become 'the done thing', and we're missing out on so much by not connecting with the very tasks that create the most precious memories. Every celebration cake in my entire life was made by my Mother or Grandmother. They were both artists in this area and many a fondant rose or piped lace covered cake graced our celebration tables. I am a rank amateur by comparison! Mum made wedding cakes for most of our childhood friends too, and they all carry sweet memories of her for those efforts. Why would you give away the privilege of generating those precious memories to another person. And leave your wallet lighter by many hundreds of dollars at the same time? Make 2015 your year of Insourcing, keep your precious, hard earned money for yourself, and guard your family's memories jealously. I started with a cake baked in a Swiss roll tin, using it as the base. I covered that in white fondant and dusted it with edible pearl dust. At the same time, I baked two small round cakes. I used two Gluten Free butter cake mixes for all the cakes as the two round ones didn't have to be thick. I cut the round cakes into rough oval shapes, one from the first cake for the brush (left hand side), and two smaller from the second cake for the jewel box (on the right). I sandwiched the two smaller ones together with a smidge of jam. 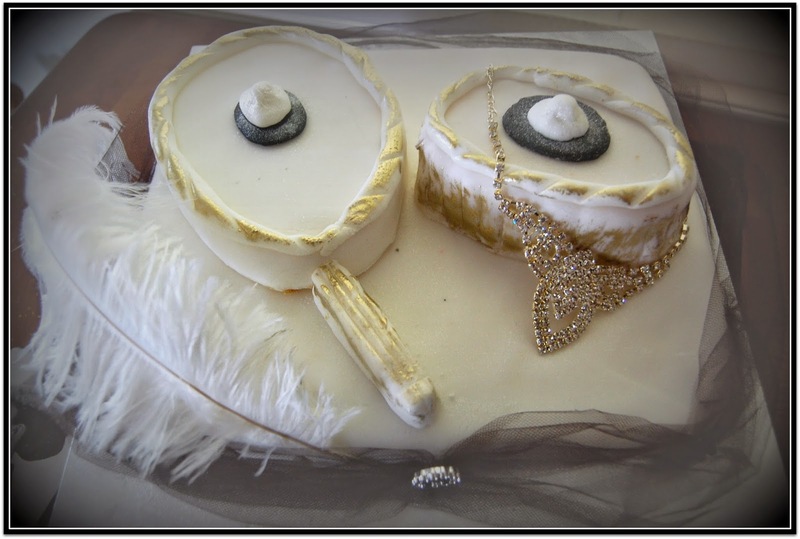 I covered the oval shapes with white fondant and transferred them to the top of the cake. They too were brushed with edible pearl dust. I then made a cameo shape in black fondant and topped it with a faux pearl embellishment for each (more pearl dust if you please!). I formed a handle with fondant, simply shaping it into an elongated squared off shape and put it in place under the hair brush shape. I used the point of a knife to drag ridges into the handle. I then rolled two long strips to decorate the edges of the mirror and jewel box, which I fixed into place with a little water. Using the same little sharp knife, I pressed diagonal indents into it to represent rope or braid. This gave a twisted effect with a lot less fuss and bother. I then mixed some food grade glycerine with a little edible gold dust and painted it lightly over the spots I wanted to accent. I was looking for a worn look, so I went very carefully, using a scant amount of the gold paint and a tiny brush. A diamante` necklace adds a bit of sparkle, and a white ostrich plume, drapes one side softly. Finally, I wrapped two layers of black tulle ribbon around the base, securing it with pins (don't eat them! ), and adding a scrapbooking buckle to the middle front. I actually had no idea how to tackle this cake and I'm not a trained cake decorator. So I'm very pleased with the result overall. More importantly, my daughter adores it and that's what matters. Happy memories in the making. She won't recall the imperfections of this cake. She'll just remember that she had a great time, with a cake made with love by Mum. Happy 15th birthday to your daughter, Mimi. Being 15 seems so long ago to me but that was when I and most of my classmates left school and went into the workforce. We thought we were quite grown up! 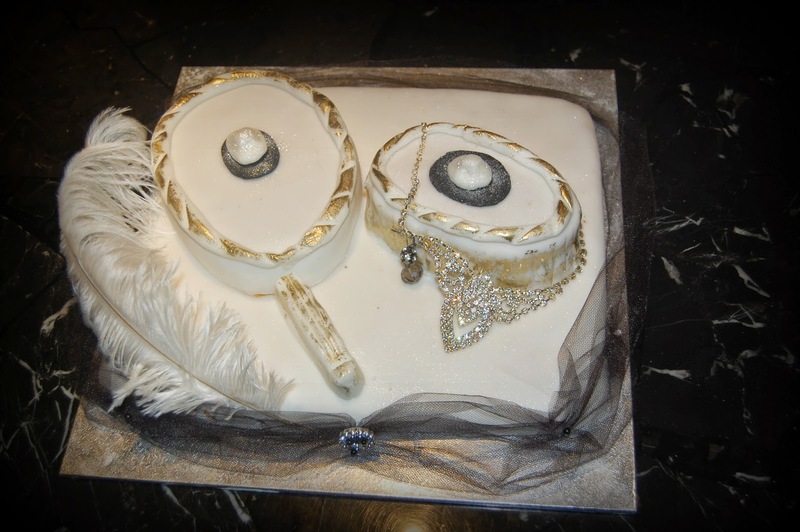 Love the cake and I also love Downton Abbey. Lol Nanna Chel. So true! We are huge Downton Abbey fans and hoping to visit Highclere Castle where it's filmed, while on our big trip this year. Very exciting! Well done Mimi. I just think all the friends will go home and ask for a party like this one! As you know I am of the opinion we dont have to be professionally qualified cake decorators, party planners, cooks or florists etc we can just do it! We never had it so good, we can search tutorials, watch you tube videos and gather tips if we really want to. "Mum made it" is always going to beat "Mum bought it" and most especially in years to come when it is a memory of what did out of love. I hope there are more photos of the party its sounds just divine! Wow, great cake Mimi and a very special 15th for your girl. Definitely worthwhile. "Amazing cake" spells "memories to last a lifetime"